Every time I'm at a Japanese Restaurant and am asked whether I want ginger dressing or something decidedly more western, I don't even have to think. I know I want ginger dressing. In fact, I'm pretty sure I make the same comment every time I eat that delicious, lumpy, orange stuff: "I could drink this." Until thursday of last week, I thought the only place I could get this Japanese delight was if I went out to eat. But then! Oh, then, I was in the refrigerator section at Publix - you know, the part where they keep the bagged salads - and what should my wondering eyes behold? Some ginger dressing, all orangey-gold. I picked up a bottle of the the dressing and some lettuce, and I went home to do my worst. The salad was delicious, even though I didn't put any ingredients in it except for just the lettuce. I was less concerned with the salad, of course, than I was with the dressing. 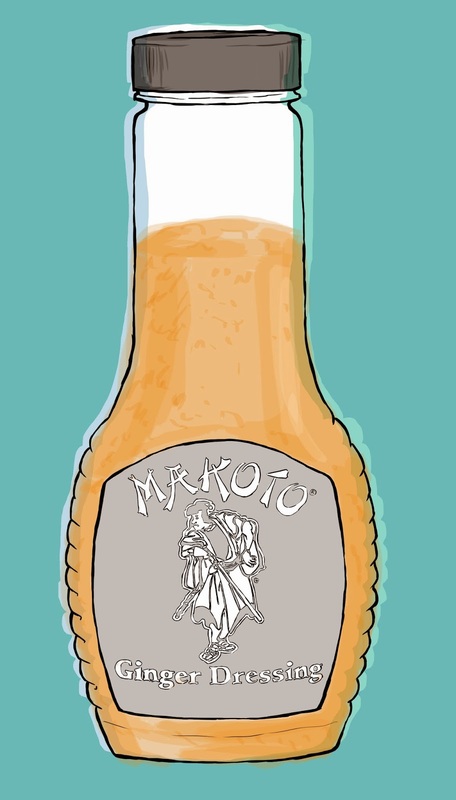 Spinsters, I am happy to report that the Makoto Ginger Dressing was brilliant. After I finished my salad (aka plain lettuce and dressing) I considered, for a brief moment pouring a little dressing on my couch cushions and having a bite of those, just to have a vehicle, but I thought better of it. That can be addictive, you know. In the end, I did not drink the ginger dressing. I do still have half a bottle, though, and if I get the urge to have an episode of Freaky Eaters about me, then I'll start having sans-lettuce salads. The main takeaway: I have found ginger dressing in the grocery store, and if you love it as much as I do, I highly recommend this kind!